After having Mohs surgery to remove a skin cancer lesion, your surgeon may perform a simple closure himself or you may recommend post-Mohs reconstructive surgery. This type of reconstructive plastic surgery can be performed immediately after any skin cancer lesions are removed. Anesthesia is given. Skin cancer reconstruction may be performed under local anesthesia, intravenous sedation (also known as managed anesthesia care (MAC) or "twilight sleep"), or general anesthesia. Your doctor will recommend the best choice for you, based on what tends to work well for the procedure you are having, as well as any other medical conditions you may have. If your plastic surgeon is the one excising the lesion, it will be done at this stage. A small lesion with well-defined borders may be removed with a simpler surgical process called excision. The lesion is removed. This step may have already been completed in a separate procedure unless your plastic surgeon is also the one removing your lesion or is working with your dermatological surgeon as a team in a single procedure. Note: If your lesion was small with well-defined borders, a simple surgical process called excision may have been used to remove it. If it was larger without well-defined borders, Mohs surgery was probably required. The wound is closed. If your procedure has been a simple excision, this is a relatively straightforward process. If, however, more complex Mohs surgery was required, there are a number of options to repair the resulting defect left behind after removal of the lesion. Regardless of the techniques used, your plastic surgeon will take care whenever possible to ensure that the resulting suture line is positioned to follow the natural creases and curves of your face, in order to minimize the appearance of your scar. After surgery. You will be observed for a while after your surgery has been completed, and then given instructions for returning home. Some people, especially those who have a flap procedure, may be given a prescription for antibiotics to take at home. It is important to talk to your surgeon about symptoms of infection and when to call. Most often your surgeon will ask you to call if you develop a fever over 101F, increasing redness, pain, or discharge. If you're given antibiotics to take, make sure to finish all of these. One of the most important things you can do to reduce your chance of infection is to refrain from smoking, as smoking interferes with healing after plastic surgery. It is important to note here that for approximately 15 percent of people, reconstruction after skin cancer excision must be performed in at least two stages. This is true mostly when certain types of flap techniques are used. The first stage creates and repositions the flap, and the second stage “sections” or separates the flap from its original location and blood supply. 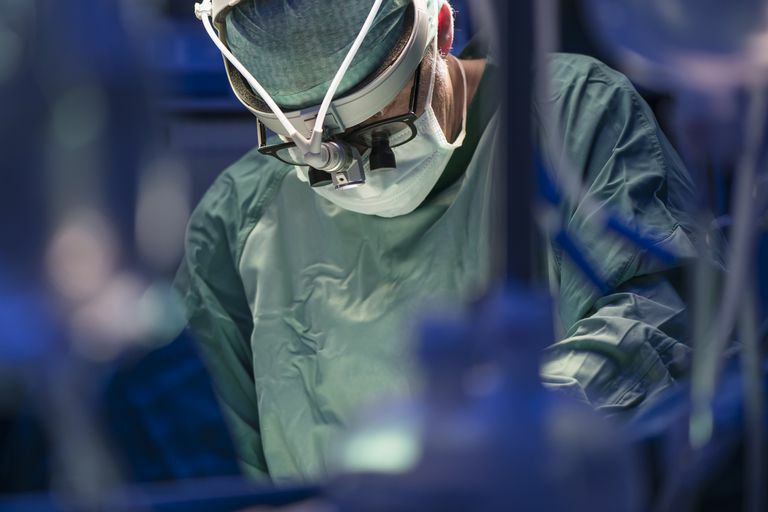 Therefore, once you have recovered and blood supply to the wound has been sufficiently established, a second surgery may need to be scheduled to complete reconstruction. Surgeries other than a flap technique may also require further procedures in order to get the desired cosmetic effect. It can be helpful to talk to your surgeon prior to your surgery about her expectations, and whether she believes the entire reconstruction can be done in one procedure, or if she expects that you will need more than one procedure. If you want to find out more about reconstructive surgery after skin cancer removal, including how it’s done, your options, and what happens after surgery. Take a look at some before and after photos of reconstruction after skin cancer. If you have a weak stomach when it comes to looking at medical photos, you may wish to skip this step, yet many people find it encouraging and comforting to see just how well facial features can be restored, even after significantly large skin cancers are removed. Mitchell, R., Mendez, Schmitt, N., Bhrany, A., and N. Futran. Antibiotic Prophylaxis in Patients Undergoing Head and Neck Free Flap Reconstruction. JAMA Otolaryngology-Head and Neck Surgery. 2015. 141(12):1096-103. Patel, S., Liu, J., Murakami, C., Berg, D., Akkina, S., and A. Bhrany. Complication Rates in Delayed Reconstruction of the Head and Neck After Mohs Microscopic Surgery. JAMA Facial Plastic Surgery. 2016. 18(5):340-6.